You spend about one-third of your life sleeping. That’s a lot of time to spend on a mattress that may not be giving you the quality sleep you deserve. Where's the best place to get a mattress? Badcock Home Furniture &more loyalists know it's with us! Our mission has always been to make mattress shopping easy for our customers. That's why we offer high-quality mattresses at economical prices. At Badcock, we offer all standard mattress sizes including queen size mattresses, king bed mattresses, twin bed mattresses, twin XL size mattresses, and full bed mattresses. Our prices are competitive and we offer convenient financing options to ensure you get the bed you want. Regardless of your budget, we encourage you to go mattress shopping today with Badcock, the best place to get a mattress. We can help you pick the ideal mattress, and our financing options are second-to-none. 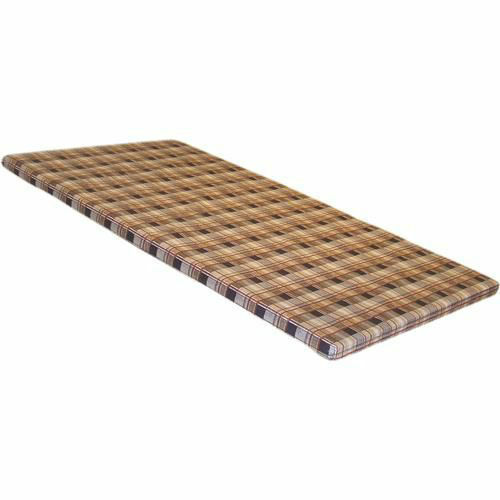 Used with bunk beds when a regular innerspring or a foam mattress is going to be used. 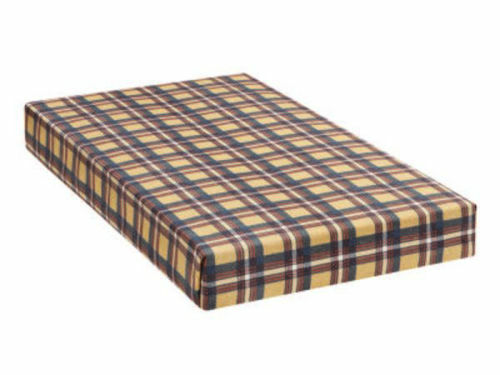 A quilted innerspring mattress mounted on a wooden frame with plaid print ticking. To be used with Captain's beds or any bunk bed set-up with rails rather than link springs. 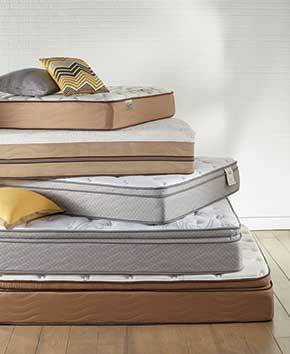 The Firm II mattress has a designer stretch knit cover with Verti-coil support system. It has a chemical free natural fire barrier with basic firm support. This group includes the Full mattress and the matching foundation. The Firm II mattress has a designer stretch knit cover with Verti-coil support system. It has a chemical free natural fire barrier with basic firm support. This group includes the Queen mattress and the matching foundation. The Firm II mattress has a designer stretch knit cover with Verti-coil support system. It has a chemical free natural fire barrier with basic firm support. This group includes the Twin mattress and the matching foundation. The Jumbo PillowTop II mattress has a Tencel® stretch knit cover with Verti-coil premium support system. Multiple layers of plush supportive foam, additional layers of high loft quilt foam and gel Memory Foam. The foam encasement edge support system has a chemical free natural fire barrier.This group includes the King mattress and 2 Twin XL foundations. The Jumbo PillowTop II mattress has a Tencel® stretch knit cover with Verti-coil premium support system. Multiple layers of plush supportive foam, additional layers of high loft quilt foam and gel Memory Foam. The foam encasement edge support system has a chemical free natural fire barrier. This group includes the Twin mattress with the matching foundation. The Plush II mattress has a designer stretch knit cover with Verti-coil premium support system. It has a chemical free natural fire barrier with memory foam while keeping a plush comfort level. Great guest room or child’s mattress. This group includes the Full mattress and matching foundation. The Plush II mattress has a designer stretch knit cover with Verti-coil premium support system. It has a chemical free natural fire barrier with memory foam while keeping a plush comfort level. Great guest room or child’s mattress. This group includes the King mattress and matching foundations. The Plush II mattress has a designer stretch knit cover with Verti-coil premium support system. 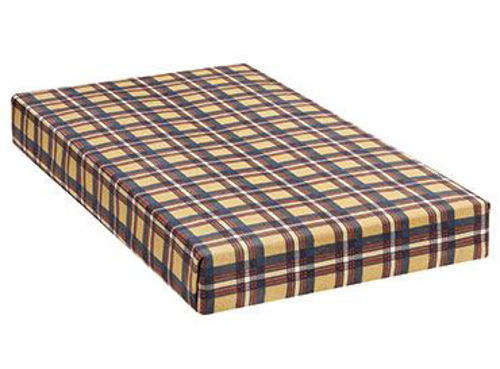 It has a chemical free natural fire barrier with memory foam while keeping a plush comfort level. Great guest room or child’s mattress. This group includes the Queen mattress and matching foundation. The Plush II mattress has a designer stretch knit cover with Verti-coil premium support system. It has a chemical free natural fire barrier with memory foam while keeping a plush comfort level. Great guest room or child’s mattress. This group includes the Twin mattress and matching foundation. The Elizabeth Smooth Top Hybrid is engineered to deliver deep conforming comfort, superior support and value. This series features a high carbon content "tempered" pocketed spring system, designed to eliminate motion transfer, and yet affords support, and conformability to the body's individual contours. Sophisticated heavy weight circular knit cover with natural Tencel fibers is used to enhance surface comfort, while soy-based upholstery grade foams and cool gel memory layers are layered with ascending support strategy. This group includes King mattress and 2 Twin XL foundations. The Elizabeth Smooth Top Hybrid is engineered to deliver deep conforming comfort, superior support and value. This series features a high carbon content "tempered" pocketed spring system, designed to eliminate motion transfer, and yet affords support, and conformability to the body's individual contours. Sophisticated heavy weight circular knit cover with natural Tencel fibers is used to enhance surface comfort, while soy-based upholstery grade foams and cool gel memory layers are layered with ascending support strategy. This group includes Queen mattress and matching foundation. The Elizabeth Smooth Top Hybrid is engineered to deliver deep conforming comfort, superior support and value. This series features a high carbon content "tempered" pocketed spring system, designed to eliminate motion transfer, and yet affords support, and conformability to the body's individual contours. Sophisticated heavy weight circular knit cover with natural Tencel fibers is used to enhance surface comfort, while soy-based upholstery grade foams and cool gel memory layers are layered with ascending support strategy. This group includes Twin XL mattress and matching foundation. The Emily Grace Super Pillow Top is state of the art design and technology. A quilted luxury pocketed spring mattress, the Emily Grace Super Pillow Top delivers deep conforming comfort and elimination of surface motion transfer. As a hybrid mattress, the thoughtful layering of high-density foam support layers affords maximum support and conformability. The addition of 2,040 Nano coils takes the Emily Grace to an entirely new level, with the Nano coils working in unison with other comfort layers for a feel that is nothing short of magical. This group includes King mattress and 2 Twin XL foundations. The Emily Grace Super Pillow Top is state of the art design and technology. A quilted luxury pocketed spring mattress, the Emily Grace Super Pillow Top delivers deep conforming comfort and elimination of surface motion transfer. As a hybrid mattress, the thoughtful layering of high-density foam support layers affords maximum support and conformability. The addition of 2,040 Nano coils takes the Emily Grace to an entirely new level, with the Nano coils working in unison with other comfort layers for a feel that is nothing short of magical. This group includes Queen mattress and matching foundation.